UAC is a new feature implemented in Windows Vista to increase security. While I would highly recommend having it enabled, some people believe it is annoying and want to disable it. Click Read more to find out how to disable it. To disable it, open the start menu and type "User Accounts" and hit enter. A window will appear with a list of choices. 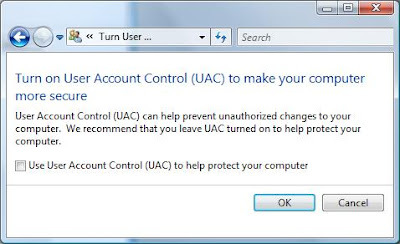 Click Turn User Account Control on or off and click continue on the UAC dialogue. 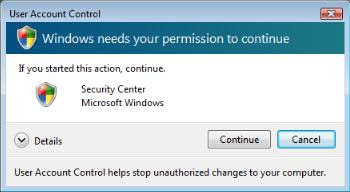 Once the new screen appears, untick the box labeled "Use User Account Control (UAC) to help protect your computer" and click OK. You will be prompted to restart your computer. Once you restart, UAC will be disabled.